It's kinda complicated, keeping track of what's play and what's 'work' with the whole rubber-stamping thing. I know all of it seems like play, and it is, but it's also work in a way when you're supposed to be turning stuff in to various companies. As my hero, The Dude would say, "...it's a lot of strands to keep in my head, man. Lot of strands in old Duder's head." So today I'm showing you my effort to tie some loose strands into a tidy bow and get them off of my to-do list. This card is a reproduction of an earlier one I did for Starving Artistamps that I ended up submitting for publication. But the owner of SA still needs her tangible sample (see how that's kinda complicated?). Being an enterprising sort, I decided to shake it up a wee bit and incorporate today's Technique Lovers' Challenge which involved inking up a Cuttlebug embossing folder before running cardstock through it. The embossed background on the Before card was plain turquoise, but this here is black-n-turquoise. Pretty snazzy, no? Baby steps of progress are better than none at all, right? Turquoise Tree 2 -- Stamps: tree and ornate tooled leather background by Starving Artistamps; Ink: Basic Black and Totally Turquoise by SU! ; Paper: Basic Black and Totally Turquoise by SU!, Georgia Pacific White; Accessories: Cuttlebug, ribbon, Martha Stewart Turquoise glitter, brads, embroidery floss. DF Snowman -- stamps: DoodleFactory Winter by Starving Artistamps; paper: Real Red and Bashful Blue by SU!, Georgia Pacific White, Green by Creative Memories; Ink: Bashful Blue by SU!, Brilliance Archival Graphite Black; Accessories: Nestabilities, stickles, Copic Sketch Markers, Cuttlebug, ribbon, 3-D Dots. DF Holiday Quad -- stamps: DoodleFactory Winter by Starving Artistamps; Paper: Real Red and Basic Black by SU!, Georgia Pacific White; Ink: Brilliance Archival Graphite Black, SU Real Red Craft; Accessories: Copic Sketch & Spica Markers, hole punch, ribbon, button brads. I'm so, so excited! Yesterday, Starving Artistamps (SA) owner and artist Tracey Berkey gave us SA Design Team members some fabulous news -- SA now owns the DoodleFactory line of stamps! Up until now, SA has just been a distributor of DoodleFactory. But these changes mean that we'll be working closely with DoodleFactory creator Irene to come up with fun new images and scenes -- yay! I really do love all things DoodleFactory and think it's one of the most unique and quirky-yet-sweet lines of stamps in the industry. And for all of you flower lovers out there, Tracey has also put together some gorgeous new floral images that you're going to go ga-ga for. There are lots of positive changes and tons of new rubber coming from Starving Artistamps, so be sure to check things out. And, if you find something you like (which of course you will), use the coupon code caroledis (as in Carole discount) and you'll receive a 10% discount off of your entire order! This offer will be good through March 31, 2008, so shop early and often, comrade! These little piggies are part of the DoodleFactory Valentine set, and the swirls are from the DoodleDads set. 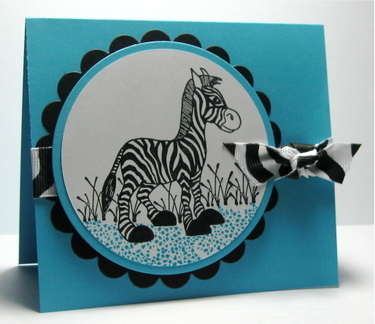 I used Jen's Sketch For You To Try, and was able to highlight some yummy striped ribbon from Jody's recent ribbon share. I can't wait to see Shannan and Susan's take on today's sketch, and joining us to make SFYTT samples for you this whole month is Jen's Guest Designer, the awesome Bethany Paull. Now, I'm going to hit the hay again and see if I can grab a couple more hours of shut-eye before the kiddos wake... Happy weekend, everybody! Supplies used -- Stamps: DoodleFactory Valentine and DoodleDads by Starving Artistamps; Paper: Green Galore, Gable Green, Pink Passion, Whisper White; Ink: Green Galore, Pink Passion, Gable Green, Pixie Pink; Accessories: ribbon, felted heart brad, Dimensionals, Copic Sketch and Spica markers, Janome Sew Mini sewing machine. I bought a couple of stamping magazines the other day and actually took the time to browse through them; I have to admit that I'll often buy magazines and then get home, get busy doing other things, put them away somewhere, and then forget I have them. The next time I'm in a store and see a copy, I have to ask myself, "Do I have that one already?" One of the pros of being stuck in a hotel room for several hours a day with little to do is that I'm actually reading the books and magazines I've brought/bought! I was looking at the publication call in the back of the latest Stamper's Sampler, and it's soliciting cards featuring the color turquoise. I've never submitted anything for publication, but this got my wheels turning... even if I don't end up submitting these, it gave me a direction to move toward which is always helpful. 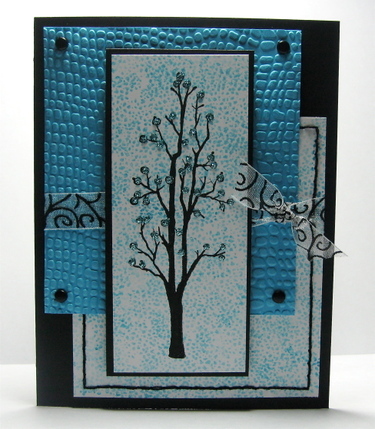 I really like the way this tree by Starving Artistamps (p.14.11) turned out. I made the background paper with a small water/rock background stamp by Artful Inkables (KSAI-209) inked in turquoise ink, by first stamping it off on scratch paper to make it a lighter shade. Then, I stamped the tree in Brilliance Archival Graphite Black, put dots of Mono Multi glue on the buds, and covered them in turquoise Martha Stewart glitter from Michael's. I wanted a little something extra on the stamped layer of background paper, and since I don't have my sewing machine with me, I pierced holes around the edges and handstitched a little border with black embroidery floss. And, while I had the black, white and turquoise cardstock out, I figured I might as well make something else, so I pulled out this cute Artful Inkables zebra (KSAI-609). This card took all of 15 minutes to make (and I think I'm probably a pretty slow card maker). I masked off the bottom half of the zebra's body and stamped the water and grass scenery stamps (these two stamps come together, by the way). A few runs of cardstock and Nestabilities through the Cuttlebug, a little bit of ribbon, and done! Doesn't get much easier than that! Supplies used -- Stamps: Tree, Zebra, scenery stamps by Starving Artistamps and Artful Inkables, available at www.starvingartistamps.com; Paper: Basic Black, Georgia Pacific White, Paper Source Turquoise; Ink: Brilliance Archival Graphite Black, Technique Tuesday Turquoise ink spot; Accessories: Cuttlebug, brads, Martha Stewart turquoise glitter, embroidery floss, paper piercer, 3-D Dots, Nestabilities, ribbon. After yesterday's Inspiration Challenge, I was in the mood for primary colors. I've been playing with this idea in my mind from the moment I saw this cute little monkey from Kristin Soboloski's Artful Inkables line. 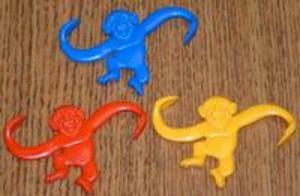 They look just like the monkeys from that oldie-but-goody game, Barrel of Monkeys, don't you think? So, I had to color 'em in with Copics and cut them out, then hook them together. I wanted a white background to show off their colors, but I also thought it needed a little somethin-somethin else. I was hoping I could find matching ribbon in my vast stash, but no such luck. The best I could come up with was primary shades of gingham. It was only as I was adhering that I though of weaving the ribbon through the monkey's free arm -- isn't that a cute touch?! I think this would be such a fun card to send a kid of any age. Both DH and DS have noticed and praised it; that's highly unusual! Speaking of highly unusual, I did a -- gasp! -- floral card!!! I know, it's shocking! But this was easy-peasy, and I think it's kinda classy, too. It's hard to go wrong with Fabriano Medioevalis paper, so even a black thumb like me can make a floral stamp like this one -- also by Artful Inkables -- look good. 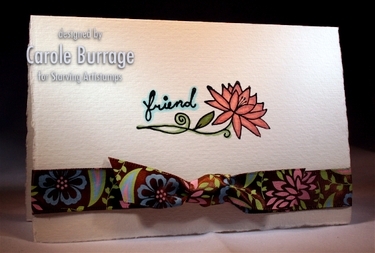 A little coloring by Copic, some pretty ribbon, and you have a great all-purpose, quicky card. LOVE that, and may just make up a stack of these to have on tap. 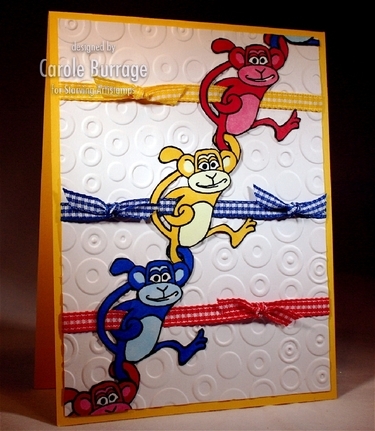 Monkey card: Stamps: monkey by Artful Inkables, distributed by Starving Artistamps; Ink: Brilliance Archival Graphite Black; Paper: Yo-Yo Yellow, Georgia Pacific White; Accessories: Copic Sketch markers, ribbon, Cuttlebug. Friendly Flower: Stamps: flower/friend by Artful Inkables, distributed by Starving Artistamps; Ink: Brilliance Archival Graphite Black; Paper: Fabriano Medioevalis notecards; Accessories: Copic Sketch markers, ribbon from Target. A Sketch for You To Try -- I.O.U.! I will post a sample of Jen del Muro's weekly Sketch For You to Try later on today. But first, the kiddos and I have to pick up DH from the airport; he's been in Romania and Hungary for the past two weeks. In the meantime, I need to straighten-up the homestead a teeny bit (understatement alert!). Anywho, here's another Artful Inkable/Starving Artistamp card for you to look at until I come up with something fab for this week's SFYTT. See you in a bit! A Sketch for You To Try! 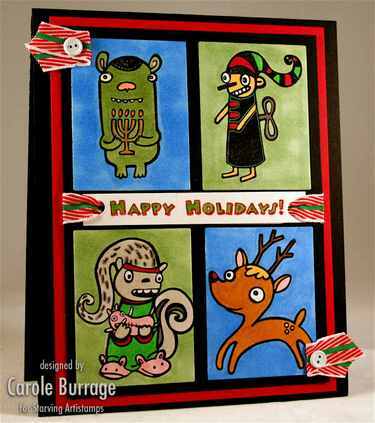 This card was made with Jen del Muro's current Sketch for You To Try, and it's a fantatstic layout. Because it's so detailed, it works particularly well when you're working with a clean, simple image, like this beautiful one from the Artful Inkables' Milestones line by Starving Artistamps. I love using Sage Shadow and Basic Gray together -- it's such an elegant color combination, with the bonus of being gender-neutral if I wanted to send this to a new mom. I also like it as a Mother's Day card. Isn't that background stamp cool? It's another one by Starving Artistamps, created for their new western line of stamps, but it's so versatile, you can use it for anything. I like it better than my SU! paisley background because it's not so solid and you can see more of the cardstock beneath it. I don't know if you can tell from the photo, but the image has been embossed with clear embossing powder to give it added depth. For more inspiration, see how Shannan Teubner and Susan Liles used this sketch. Supplies used -- Stamps: Image and Sentiment by Artful Inkables for Starving Artistamps, background by Starving Artistamps; Paper: Sage Shadow, Basic Gray, Georgia Pacific white, vellum; Ink: Sage Shadow, Basic Gray, VersaMark; Accessories: Nestabilities, hole punch, brads and photo holders, ribbon, 3-D Dots. 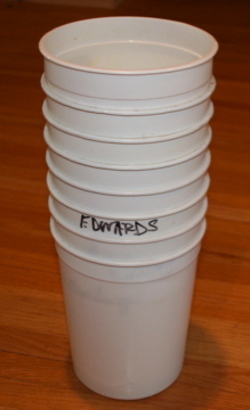 See these buckets? They used to hold macaroni salad or coleslaw in the salad bar at Truman's school. I hold the unfortunate title of Treasurer of the Central Upper Elementary P.T.O., and thus, I am one of the few compulsory worker bees when it comes to fundraising events. 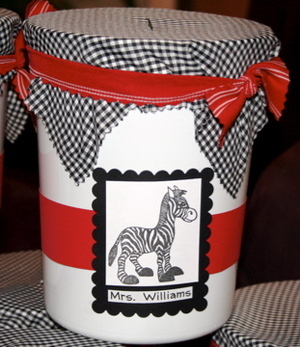 I had to transform 45 of these buckets into cute containers in which parents and students could contribute to their classroom activity funds. I tried to get the teachers to have their pictures made for their containers, and a few did, but the majority didn't show up to the photo session. What to do? Well, our school district's mascot is the Zebra, and I had just received a big batch of stamps in from the abovementioned Starving Artistamps, including Artful Inkables' adorable zebra. So, here's what you can do with a little fabric, some cardstock, a stamp and some ink. Ways To Use It Challenge 137: to use the masking technique. Color challenge -- well, I used those colors. Sketch Challenge? I used the sketch. Ways to Use it: Elzybell, her sled, and the snow was masked off to create the sky background by stipple brushing Soft Sky. Both the image and the sentiment are Elzybells; based on the size of the image layer, I wanted to stagger the sentiment. In order to do so with Purely Pomegranate (which as a current In Color -- aka temporary -- SU! color, PP doesn't have its own marker to ink the stamp with, and I'm not careful enough to be able to ink just a bit of the sentiment with an ink pad), I brushed re-inker on the sentiment stamp and positioned it with my beloved Stamp-A-Majig (definitely a tool that would make it to the proverbial Desert Island with me). Elzy (that's what I call her, for short)'s coat is trimmed in Liquid Applique, and her tree is decorated with A Muse twinkle stickers. She's colored with Copic Sketch Markers and SU Re-inkers in Purely Pomegranate and Soft Sky. There are touches of sparkle throughout, thanks to Copic Spica Markers, though I'm not sure they show up in the photo. Supplies used -- Stamps: Girl with Sleigh and sentiment by Elzybells Art Stamps, distributed by A Muse Artstamps, Canvas bg by SU! ; Paper (SU! unless otherwise noted): Basic Gray, Purely Pomegranate, Soft Sky dp, Nena Crest Solar White (available from Ellen Hutson's online store); Ink: Brilliance Archival Graphite Black, SU! Reinkers in Purely Pomegranate and Soft Sky; Accessories: Copic Sketch and Spica Markers, A Muse Twinkle Stickers, stipple brush, SU! ribbon, snowflake brads by Creative Impressions, Nestabilities, Liquid Applique. I was pleasantly surprised last week to find an email inviting me to be a member of Starving Artistamps Design Team! I had applied a while back for the DT call, having fallen MADLY in love with the DoodleFactory images that SA distributes. I say I love a lot of stamps -- and I do -- but DoodleFactory? Those images are truly muse-like for me. I just love, love, love their unique-ness. They're quirky and subversive while at the same time adorable; and for me, that is an irresistible combination. Anyway, I figured Tracey Berkey (owner/operator of Starving Artistamps) must be one cool chick to realize the potential of something as off the beaten path as DoodleFactory, so I REALLY, REALLY wanted to be a part of the SA DT. I've applied for a couple of other DTs in the past and didn't make the cut, but those didn't bother me so much. I've written in an earlier post about rejection just meaning you haven't found your 'tribe' yet, but this was one tribe I felt I was meant to be a part of. I'm really grateful that Tracey agreed, and I'm stoked to be on a team with the like of such stamping luminaries as the ROCKIN' TexasJodyLynn aka Jody Morrow, annieht aka Ana Wolfarht, andreasscraps aka Andrea Cloutier, Cammie aka Carolyn King, Donnarie aka Donna Duquette, SweetHeidiJo aka Heidi Kingery, Jan Tink aka Janine Tinklenberg, Wasatch Wizard (and designer of the awesome and new-to-me stamps, Artful Inkables, available through SA) aka Kristin Soboloski, tashers aka Natasha Trupp, stampingpam aka Pam Varnell, stamps4funinCA aka Tosha Leyendekker, and Valorie Wibbens (not sure of her SCS screen name yet!). 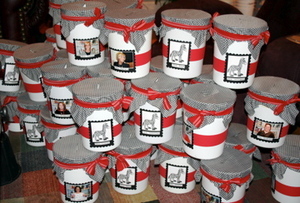 I'll have links to all of these amazing stampers' blogs or galleries in a special section soon. I hope you'll take the time to get to know their work, as I'm certain you'll find so much to inspire you. Coming tomorrow: Freaky Friday and all the deets regarding my time in the white hot spotlight of Who Wants to Be a Millionaire and -- almost as thrilling -- SCS Featured Stamper! In the meantime, I'm in desperate need of some sleep to recover from all the recent excitement!